Gurumin 3D: A Monstrous Adventure landed on the 3DS eShop yesterday, and to celebrate an extended launch trailer has been unveiled - which we have to say is more than a little bit funky. Join Parin and her Monster pals as they fend off evil Phantoms in effort to save Monster Village and the entire world in this colorful Action-RPG from renowned Japanese developer, Nihon Falcom. Quest through 30+ stages with non-linear gameplay across a wide variety of environments, with loads of enemies, epic boss battles, traps, teasure, upgrades, equippable costumes, headgear, fully voiced characters by an all-star cast of voice actors, and more! 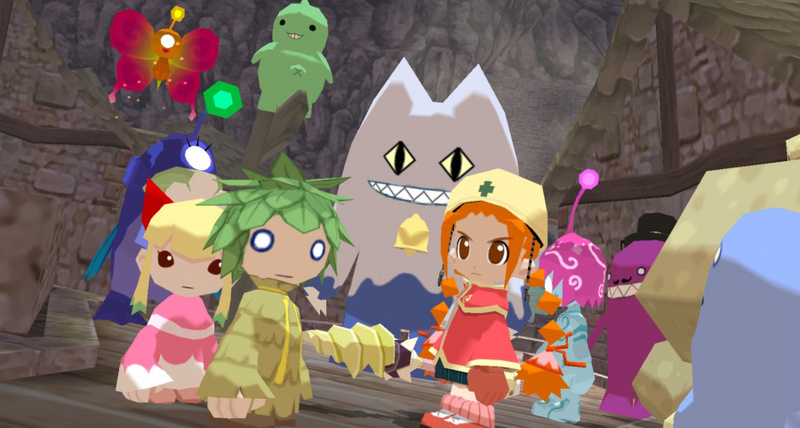 We really enjoyed our time with Gurumin 3D in our recent hands on preview. Our full review will be coming up shortly, but if you've already taken the plunge be sure to let us know what you think of this one with a comment below. Wow, this looks pretty good actually! A bit like a 3D platformer. One of them looks like the alien from Alien On The Run. Hm... looks a bit interesting for me. Anyone getting a 90s vibe from this? I was interested in this especially considering the price so I decided to see what review scores were out there. While none were up for the 3DS the PSP version from years back got mostly favorable reviews. I'll be grabbing it, but for some reason seeing this really makes me wish that Chime's Dreamcast game Napple Tale: Arsia in Daydream got a 3DS port. I've clocked in about 4 hours so far. The polish is a bit to be desired, but it's well put together enough to look past some of its faults. My biggest criticism is that as far as I know, there doesnt seem to be any stage maps, so be sure to keep track of where you go so you can make good time (much less avoid losing time). @manu0 Yeah, I'm extremely disappointed by the framerate. I was hoping it'd be fixed and didn't want to hold out for a review, but even in the starting town it's rough, and it's left me mighty discouraged about progressing from here. There are some nasty framerate issues so far even on the new 3DS - an option to turn off Parin's/Gurumin (I definitely named Parin Gurumn) drill attack special effects would do a lot to rectify that, I think. I picked this up, mostly due to it being a Falcom game, and my god, the VAs are genuinely horrible, even for an early 00s game. Also controls feel just really... off? Dunno how to explain it. I've only just started playing but first impressions aren't too good. Still needs a physical release! As others have mentioned, there are issues. I want a map! Framerates are variable, even on N3DS. Biggest problem for me seems to be the 3D is a bit wonky at times making me feel a bit cross eyed and having to adjust the slider a lot. I'm still enjoying it, tho, and like the game. I'd rather have issues with a $15 game than a $40 game. I'm about 1:30 hours in. It's a fun game so far. Sure, it's a bit rough around the edges in some respects, but nothing big enough to hinder my enjoyment of the game. It sure feels like a PS1 era game, which is kind of nostalgic.